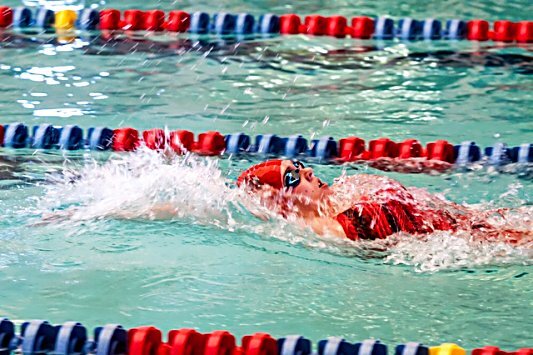 Glenwood Springs High School's Jessica Tuttle competes in the 400-yard individual medley during this past weekend's Montrose Invitational swim meet. Tuttle won two events over the weekend. Glenwood Springs High School’s girls swimming team won 10 of the 23 events at the Montrose Invitational meet this past Friday and Saturday while nearly sweeping the relay events on their way to the team title. The Demons claimed the team championship with 485.5 points, which was bolstered by the relay’s double-scoring system. Glenwood won three of the four relays, with only .03 seconds separating the Demons from a first-place finish in the 200-yard freestyle relay. The Grand Junction Tigers — whose relay team outtouched Glenwood in the 200 free relay to keep the Demons from sweeping the relays — finished second in the team standings with 403.5. Montrose (393), Aspen (273), Gunnison (194) and Montezuma Cortez (186) trailed in the team standings. The coach had more reasons to be pleased following the completion of the two-day meet. The Demons have three individuals — Kendall Vanderhoof, Jessica Tuttle and Hannah Peterson — who have posted state-qualifying times in two or more individual events for the Class 4A State Championships, which is scheduled for Feb. 14 and 15 in Thornton. Each of Glenwood’s three state sanctioned relays — the 200 medley and the 200 and 400 freestyle relay teams — have also qualified for the state meet. Glenwood’s 200 medley relay team of Zoe Lyon, Tuttle, Peterson and Vanderhoof became the team’s third relay qualifier by winning in 1 minute, 59.99 seconds. Tuttle managed both of her state-qualifying times this weekend by winning the 200 individual medley (2:19.14) and the 200 butterfly (2:15.37). Vanderhoof posted a state-qualifying time in her fourth event, doing it in the 100 freestyle by posting a time of 56.03 seconds while swimming he first leg of the Demons’ 400 free relay. She also finished first in an extreme long-distance event, winning to 1,000-yard freestyle in 11:35.58. Glenwood got breakout performances all around, however, with second- or third-place finish in seven events. Also among the individual standouts was Lyon, a freshman who won the 50 backstroke in 31.53 and was third in the 200 backstroke in 2:30.98. Lyon, however, was held out of Saturday’s meet due to an injury she suffered on Friday, coach Vanderhoof said. The Demons now have off until Jan. 10, 2015, when they travel to Frisco to compete in the Summit Invitational.